Your home’s curb appeal starts at the curb, which means if your driveway isn’t looking pristine, then your home isn’t looking its best. If that’s the case, it’s time for a driveway pressure washing. Driveways can attract all sorts of dirt, grime, debris, oil, and organic matter. Not only does your driveway attract these unsightly stains and debris, but these spots can cause safety issues or even bring unwanted attention from your home owner’s association. The longer you wait the more the stains set in and the more your driveway deteriorates from the dirt and unwanted chemicals. The Power Washing Man is on your side! Driveway power washing requires a special touch, the right mix of cleaners and protectants, and years of experience. We have all three! You do not need to be told why unsightly stains should be washed away from your driveway. They’re ugly, they’re a safety hazard, and they decrease your home’s value. The Power Washing Man can strip away the grime from your driveway and leave you wondering why you didn’t do this years ago. Stains happen for any number of reasons. Weather and wind can bring dirt, cause water to pool, and leave debris strewn across your driveway. This not only looks bad but can hasten the deterioration of your driveway and cause or spread cracks. We can pressure wash away dirt and debris, leaving you with a spotless and pleasing drive. 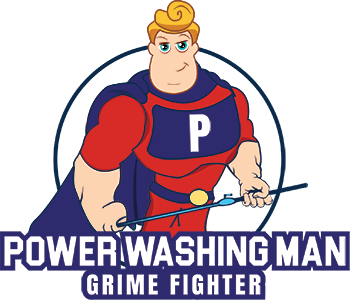 If your car, or anyone else’s, has left behind a stain then you need to call Power Washing Man. A leak of oil or gas from a car can leave hard-to-clean stains on your driveway. This will not only take away from the aesthetics of your home, but can cause slipping, and may even be against your neighborhood’s homeowner rules. We have a special mix of soaps, degreasers, and years of experience that can get out set in stains. Don’t overlook your driveway’s importance to the aesthetic beauty and functionality of your home. Power washing can improve both. Give us a call for a free estimate! Cracks in the driveway are a problem that every homeowner faces at one time or another, but did you know power washing can help? If you want to prevent cracks from forming or minimize the spreading of the ones you already have in your drive, cleanliness is key. Cracks can occur because of factors outside of your control, like uneven surfaces or the earth beneath your property settling. But what often makes a crack worse is the organic matter like dirt that falls in. What happens when dirt falls into these cracks is that small plants like weeds are able to grow. Not only does this take away from your home’s aesthetic beauty, but the weeds’ growth accelerates the crack’s growth, too. The Power Washing Man can clean out these cracks effectively. We are not only killing the plants but clearing out the dirt that allows them to grow in the first place. Contact us today to see how we can beautify and preserve your driveway trough power washing. The short walk from your door to your car, to your trashcans, to your newspaper likely requires a stroll down the driveway. While this is probably a short, innocuous walk for you that doesn’t mean you shouldn’t keep your driveway as clear of slippery spots and uneven surfaces. Things like cracks in the driveway can be easy for you, your family, your guests, or your pets to trip on. Pressure washing helps to fight the spread of cracks in your driveway, as well as eliminating plant life that is easy to slip on. Oil spots are even easier to slip on but also can slicken your tires as you head out onto the road. 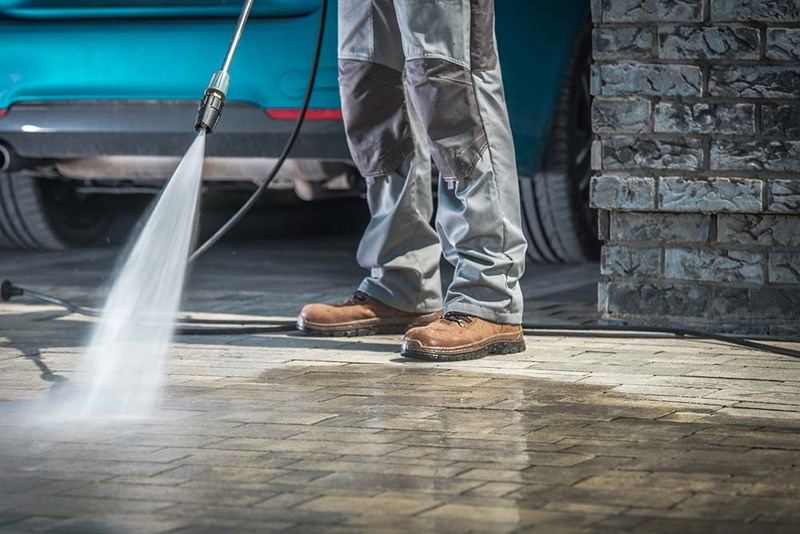 Safety may not be your reason for considering having your driveway power washed, but it is a noteworthy perk that comes with it. Microorganisms on your driveway can cause biological contamination. If untreated, these unsightly, and potentially hazardous, nuisances will grow worse with every rainfall. Power Washing Man can identify and properly remove biological contaminants from your drive. 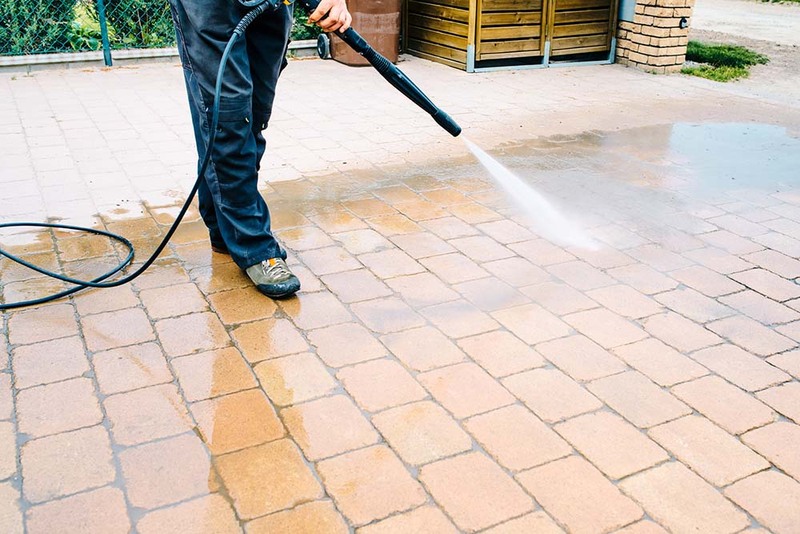 It’s easy to take your driveway for granted when it comes to health and safety, but if you keep it professionally clean by utilizing our pressure washing services you’ll never have to worry. Keeping your driveway clean is an important part of home upkeep. The Power Washing Man offers an experienced hand, competitive pricing, and friendly service. Most importantly, we’re offering you a clean and safe driveway that increases your property value and makes your home even more safe and beautiful. For a free estimate give the Power Washing Man a call today! Curb appeal starts at the curb. If you are trying to sell your house, or just to improve its appearance for your own satisfaction, then consider having your driveway power washed. A pristine driveway stands as a shining welcome mat to you and your guests. It is easy to overlook the driveway as a part of the aesthetic beauty of your home, but a power-washed driveway gives any home a clean and bright entryway. If a potential buyer arrives at your property for a tour or open house and has to step over oil or dirt stains or weeds growing through cracks in the driveway, they’ll be turned off before they even get in the front door. First impressions are important, and the driveway is the very first impression any buyer will get. If you have oil stains, dirt stains, cracks, or weeds on your driveway, do not allow yourself to grow accustomed to their presence. Allow the Power Washing Man to clean, beautify, and increase the curb appeal of your home by washing and chemically treating your driveway. Call us today for a free estimate!